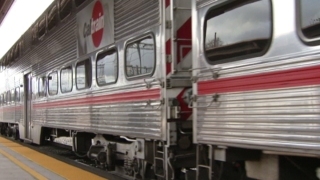 A 54-year-old bicylist was killed by a train Friday morning in San Jose, a Caltrain spokeswoman said. He was Caltrain's eight death of 2016. At about 8 a.m. northbound Caltrain No. 329 hit a person at the West Virginia Street railroad crossing. Caltrain officials are holding trains in the area. Train No. 329 has about 300 passengers on board. A bus bridge is being set up between the San Jose Diridon and Tamien stations.